Hello everyone hope you are well. Today I am wearing my favorite pair of white shoes. They are so much fun and comfy to wear. The best part is they go well with just about anything. And washable too. Isn't that great? There is something about the color white that I tend to buy anything and everything in white and this pair came out to be too good. I bought this white bag long back but somehow it never gets to leave my wardrobe. It's great I found it recently and I am loving it. About this dress I quite like the floral print and the length of the sleeves. Have an amazing week y'all. Till next time, bye. Love this dress and the prints! What a pretty dress! I love the colors and prints and those sunnies are adorable! I'm so obsessed with your shoes! How cool are they?! I love your dress too, looks gorgeous on you! I love the white accessories against the green of the dress, it goes perfectly! I love the shoes, they look nice but comfy at the same time! That dress is stunning and your shoes are so cool! I love that chunky heel. Fabulous dress and cool boots! Just love this look! Such a pretty printed dress. Love this look, and your shoes are to die for! Awesome that you have a fave pair of shoes that go with a lot of outfits! I'm loving your dress... super cute green and florals! Can we talk about that dainty bracelet - so cute! 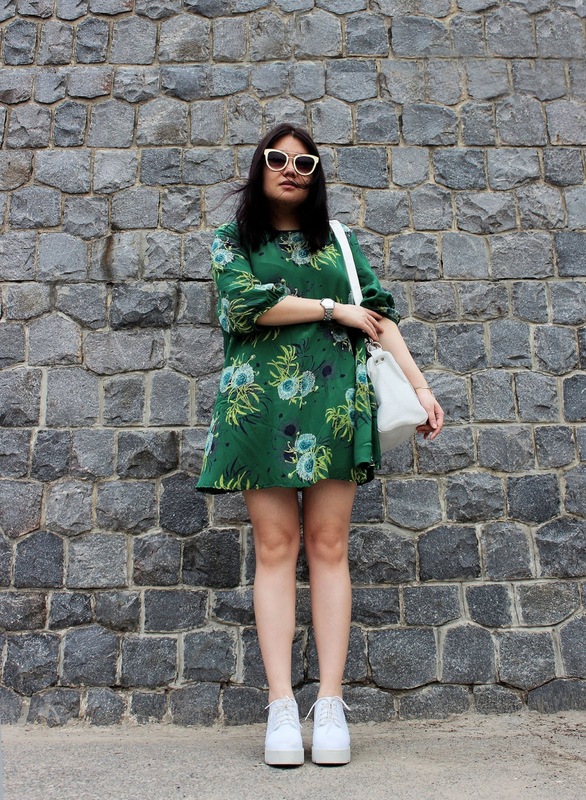 Love this green dress and print on it!! Looks beautiful dear! Super beautiful dress and love the white touches of the accessories in the look! I love this dress on you, the print is gorgeous! Also obsessed with that bangle! This is such a fun and stylish look, girlie! I love the shoes paired with the dress and I adore your bracelet! I hope you're having a great start to your week so far! Marvelous dress and the print is fab! Your sunglasses is an extra special touch. Loving those white shoes! I can totally see why they are your favorite! Eye catching colors and prints. Green is totally your colour! Loving the dress and sneaker combination.